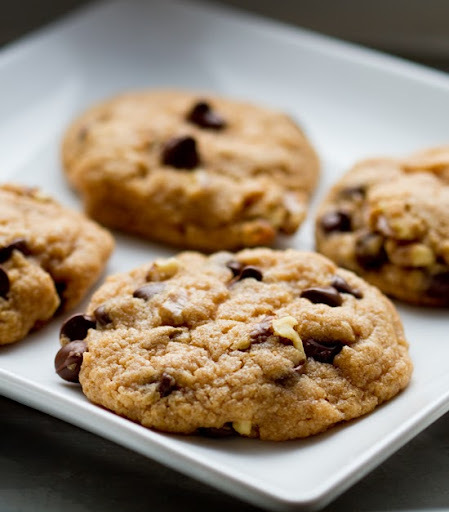 Chocolate Chip Walnut Cookies. vegan! 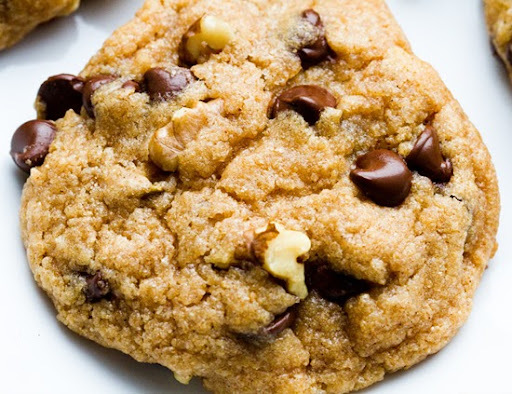 We've all had a classic Chocolate Chip Walnut Cookie at some point in our lives. It's a classic for a reason: it's delicious. 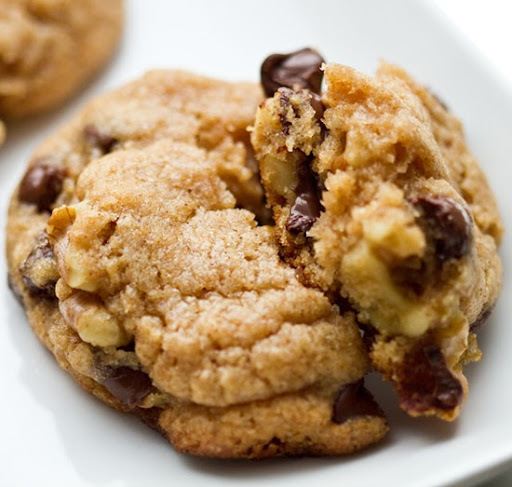 Crunchy oven-toasted walnuts mingling with velvety chocolate chips, all interlaced with a chewy, buttery, vanilla-essenced classic cookie base. I add cinnamon and a splash of luscious maple syrup to enhance the flavor. 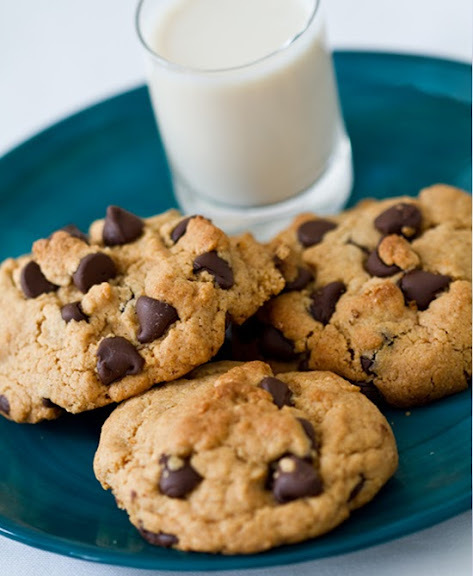 I serve my cookies warm-from-the-oven, with an ice cold glass of unsweetened soy milk. 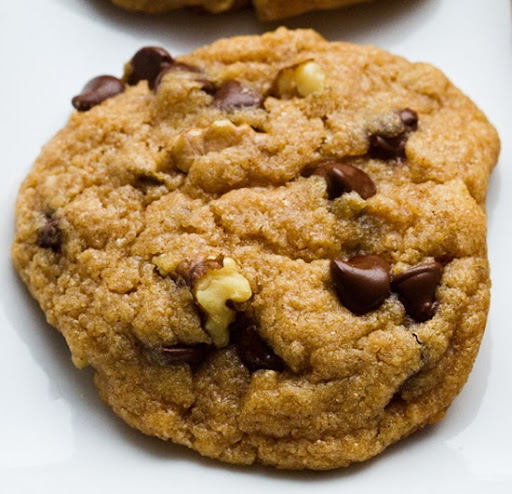 *don't miss my peanut butter chocolate chip cookie modification: just added! 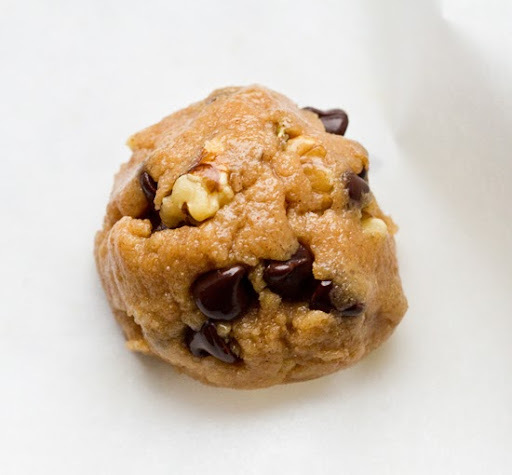 Peanut Butter Chocolate Chip Cookie Modification. See recipe notes at bottom for details. More pics below as well!.. 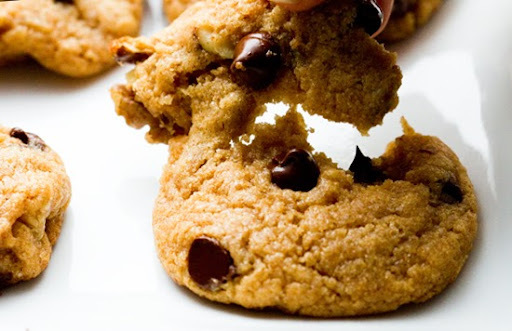 Everyone Loves a Good Cookie. Last week I was watching Bravo's new foodie Top Chef spin-off reality show, Top Chef Just Desserts. It was the "Bake Sale" Challenge Episode: Half-Baked. The Chef-testants had to prepare several desserts for a Prep Squad vs. Glee Club Bake Sale. One of the most successful recipes was made by Chef-testant Erika. 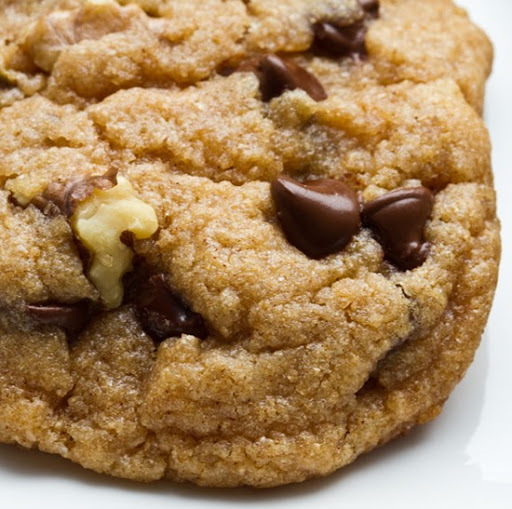 She made her simple family recipe for Chocolate Chip Walnut Cookies. photo #3 in the slideshow (it's mislabeled for some reason). Even amidst the fancier schmancier "Bake Sale" treats like a Coconut Cupcake with Salted Caramel Buttercream and even a Mocha Financier with Orange Creamcicle Sauce, made by Chef-testant Seth, Erika's simple cookie left the judges swooning. My first reaction: I love choco chip walnut cookies too! 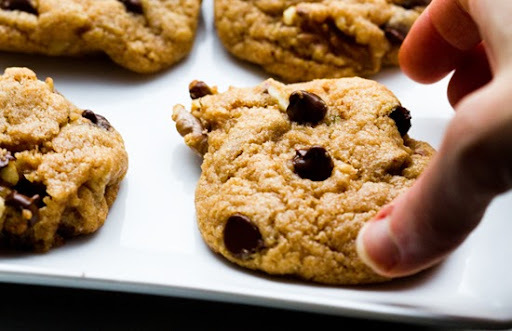 And the vegan version is just as delicious as the classic recipe you can find on the back of most any package of chocolate chips! If not better..
Who wants to drop two sticks of butter into their cookies anyways? (I know, a lot of people, but not me! 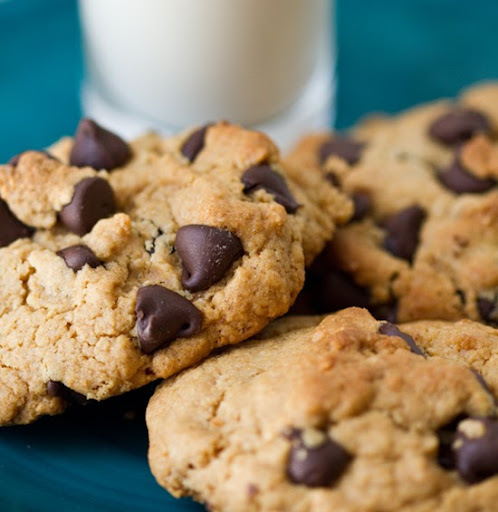 And they won't want to after tasting these cookies.) And how about replacing that white refined flour with some fine whole wheat baking flour? And lets remove those unnecessary eggs and replace them with some moist, tart applesauce. 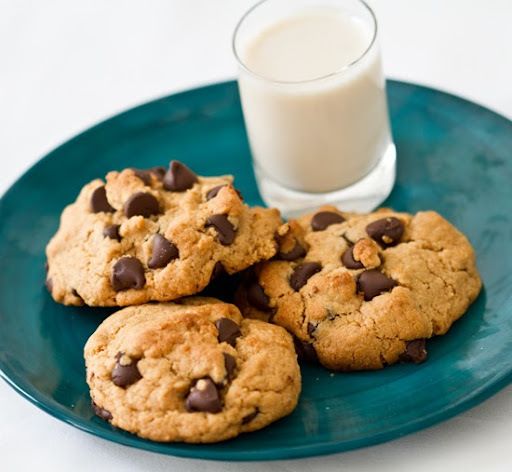 Let's veganize those cookies to make them tastier and better for you than ever. Posting My Classic. So yes, I realized that I had never posted this classic cookie recipe and despite it's slight lack of uber-creativity, I am posting it now because... it's delicious. And everyone can relate to the flavors. 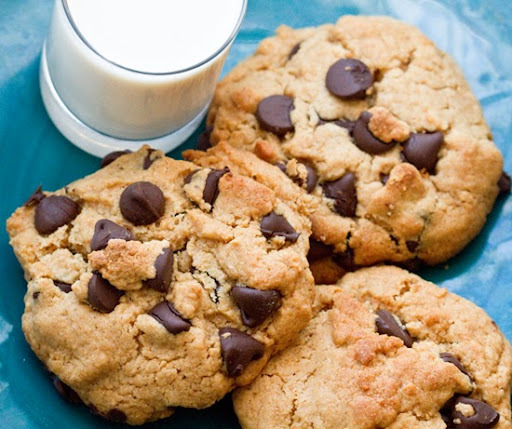 My husband's comment (and he is a major cookie connoisseur) "These are really good! Maybe the best cookie ever!" I smiled. "Yea, I know." ..I call these my Cocky Cookie. Make them, and pretty much anyone (vegan or not) will love them. A recipe to feel cocky about. Classic, yet re-designed to be healthier, happier and animal-product free. **since brands differ, use your own discretion to evaluate when the dough is at a right consistency. Tools: Parchment paper, large mixing bowl, spoon, freezer, oven. 1. Fold together these dry ingredients in a large mixing bowl: flour, salt, baking powder, cinnamon and cayenne. 2. Place the chilled buttery spread and canola oil in the microwave for 15 seconds. This should soften the buttery so that folds into the batter easily. For now, set it aside. 3. In a separate bowl, mix together the apple sauce, vanilla extract, maple syrup, dry sugar and the oil mixture. Stir well, then add this to the dry mixture. Keep stirring until the liquid becomes absorbed by the dry ingredients. 4. I added in a Tbsp of water here to loosen the dough just a tad. 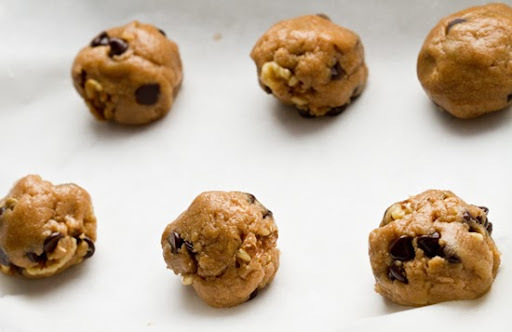 When your dough is perfectly combined, fold in the chocolate chips and walnuts. 5. Next, stick the dough in the freezer for 20 minutes. This is a good time to preheat your oven to 375 degrees. You can also prepare your baking sheets. I like to line my sheets with a cut layer of parchment paper. Do not let the paper hang over the edge of the sheet or it may burn while in the oven. 6. When the 20 minutes are up (longer if you'd like - even overnight) Grab your bowl and start scooping the hardened dough into little balls. The dough should be firm enough so that you won't need an 'ice cream scooper' - you can simply roll out balls with your hands. However, a scooper can be helpful for keeping measurements of dough on sync for even sized cookies. 7. Place your cookies in the oven for 10 minutes. Sometimes 8-12 minutes. But I usually just go with 10. 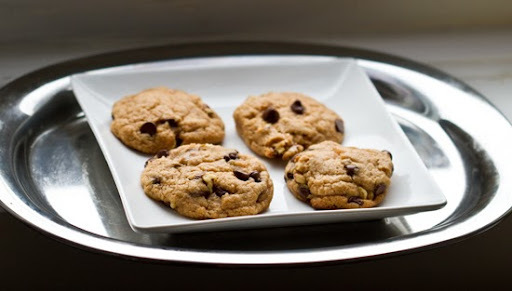 I am not a fan of over baked cookies, so I like to bake get all my cookies in the oven at the same time, bake for ten minutes, then let them rest in the oven for an additional 5 minutes (with the oven turned off). I find that this allows the cookies to puff up nicely, but I don't have to worry about pulling them out of the oven ASAP once they are done - which can sometimes unsettle the natural fluffiness. 8. Allow to cool for about 10 minutes before serving. Serve with a glass of ice cold unsweetened soy/almond/hemp/rice milk. I store mine in a bin on the counter for up to one day - then I transfer the leftovers to the freezer. 2)Remove vegan buttery spread altogether. 2)Decrease canola oil to 1/4 cup. Recipe Notes: You can use a tad less sugar if you want a less-sweetened flavor. I found the 1 cup to be reminiscent of the true classic Choco-Walnut cookie, however it is a tad on the sweet side. You can sub agave instead of maple is you MUST. But I highly advise trying maple syrup - it adds a special hint of flavor that makes these cookies sing. You can substitute the whole wheat flour with spelt or even a mixture of white/whole wheat - however I found the 100% whole wheat flour to work well. If you do not like the milk apple sauce flavor that comes from the applesauce, you can replace it with another 'puree' like pumpkin, sweet potato, pear, butternut squash or even plain yogurt if you'd like. I personally love the flavor and texture the applesauce provides, but you can easily swap it out for a similar ingredient. For the canola oil, you can subt with coconut oil if you prefer. If you are not using any vegan buttery spread for some reason, add another pinch of salt. Lastly, if you are confused about what dry sugar to buy, this VegSource article is helpful. And back to walnut. Both are delicious!..